A Little Town That Dreamed of Greatness. —. Florence was born after the 1854 Kansas-Nebraska Act opened lands west of the Missouri River to speculators and settlers. Build on the grounds of Winter Quarters, founder James C. Mitchell named the new town after his granddaughter, Florence Kilbourne. 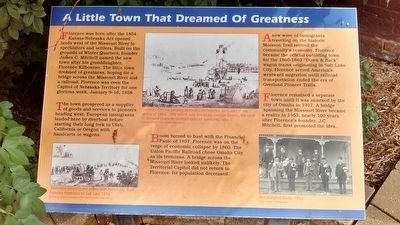 The little town dreamed of greatness, hoping fora bridge across the Missouri River and a railroad. Florence was even the Capitol of Nebraska Territory for one glorious week, January 9-16, 1858. The town prospered as a supplier of goods and services to pioneers heading west. European immigrants landed here by riverboat before starting their long trek to Utah, California, or Oregon with handcarts or wagons. Boom turned to bust with the Financial Panic of 1857. Florence was on the verge of economic collapse by 1860. the Union Pacific railroad chose Omaha City as its terminus. A bridge across the Missouri River looked unlikely. The Territorial Capitol did not return to Florence. Its population decreased. A new wave of immigrants traveling on the historic Mormon Trail revived the community's economy. Florence became the official outfitting town for the 1860-1863 "Down & Back" wagon trains originating in Salt Lake City. Florence served America's westward migration until railroad transportation ended the era of Overland Pioneer Trails. Florence was born after the 1854 Kansas-Nebraska Act opened lands west of the Missouri River to speculators and settlers. Build on the grounds of Winter Quarters, founder James C. Mitchell named the new town after his granddaughter, Florence Kilbourne. The little town dreamed of greatness, hoping fora bridge across the Missouri River and a railroad. Florence was even the Capitol of Nebraska Territory for one glorious week, January 9-16, 1858. Florence remained a separate town until it was annexed by the city of Omaha in 1917. A bridge spanning the Missouri River became a reality in 1953, nearly 100 years after Florence's founder, J.C. Mitchell, first promoted the idea. Location. 41° 20.264′ N, 95° 57.639′ W. Marker is in Florence, Nebraska, in Douglas County. Marker is on 30th Street, on the right when traveling north. Touch for map. Marker is in this post office area: Omaha NE 68112, United States of America. Touch for directions. Other nearby markers. At least 8 other markers are within walking distance of this marker. From Indian Lands to the Golden Gate (here, next to this marker); The Bank of Florence (within shouting distance of this marker); Mormon Pioneer Memorial Bridge (within shouting distance of this marker); Winter Quarters (about 700 feet away, measured in a direct line); The Mormon Pioneer Trail (approx. 0.3 miles away); A Meeting House for the Saints (approx. 0.3 miles away); The Florence Mill (approx. 0.4 miles away); a different marker also named The Florence Mill (approx. 0.4 miles away). Touch for a list and map of all markers in Florence. More. Search the internet for A Little Town That Dreamed of Greatness. Credits. This page was last revised on June 16, 2016. This page originally submitted on November 12, 2015, by Tom Bosse of Jefferson City, Tennessee. This page has been viewed 383 times since then and 16 times this year. Last updated on November 14, 2015, by Keith S Smith of West Chester, Pennsylvania. Photo 1. submitted on November 12, 2015, by Tom Bosse of Jefferson City, Tennessee. • Andrew Ruppenstein was the editor who published this page.